Bob, who's a fairly bright guy, went out to the bowling alley with his buddies. They noticed that some of the bowling pins had the typical red stripes and all of the others had black stripes instead. At one point after a new set of 10 pins were laid down, Bob commented that there were no equilateral triangles formed by pins with the same color stripes. How many beers did Bob have by that point? Provide a proof. No consider the bottom two corners of the larger triangle. They would have to be "o" in the schematic because of the bold underlined "x"s. With both of those the top would have be an "x" because of the largest triangle possible would be the same color but this can not be because the triangle created by the top 3 pins. Therefore this is not possible and this guy is clearly hammered since he couldn't see this. Does this have anything to do with Ramsey theory? It doesn't have anything to do with the fact that any two-color coloring of all possible lines connecting the vertices of a hexagon (without any three colinear points) must create a monochromatic triangle, at least as far as I can tell. And there's probably more to the theory than just that. But for this case, we're told the color of the bowling pins' stripes, not lines connecting them, and they sit in a hexagonal tiling with lots of colinearity and every angle being a multiple of 60 degrees. Nah, it's pretty straightforward with a moderate amount of logic-ing. I'm surprised it hasn't been solved yet, unless the issue lies in understanding what the question is really asking for. That’s my issue, for sure. I’m assuming we are to require each equilateral triangle to have heterochromatic vertices (rather than edges). This solution works(ignore the dots). 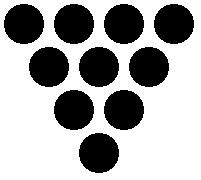 if four of the tenpins were replaced with beer bottles (preferably with black stripes), Bob could see this pattern; perhaps he drank them. American beer is generally roughly 10 proof. So if he had that arrangement Captain Ed showed and X's were red striped while O's were black striped, he would have the equilateral triangle of red pins shown in blue (plus a horizontal mirror image of it connecting three black striped pins in an equilateral triangle). And your task is to prove how many cold ones he had when he made that statement. Dang! I guess I was using fuzzy logic. Imagine drawing two equilateral triangles in a star-of-David pattern connecting the six pins that surround the central pin (connecting B, F, and H and connecting C, D, and I as shown below). 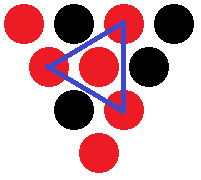 Since those two triangles are equilateral, neither of them can be all one color. Pick one pin from one of the triangles and color it the central pin's color (say pins E and B are both red), and you know that the other triangle (C-D-I) must also have at least one pin that's the central pin's color so it's not monochromatic. If either C or D is the same color as B and E, then they'll form an equilateral triangle, so the only possible solution would be if pin I is the same color as B and E.